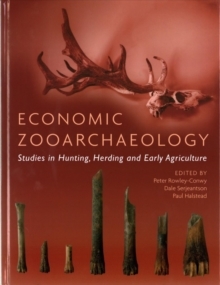 Economic archaeology is the study of how past peoples exploited animals and plants, using as evidence the remains of those animals and plants. The animal side is usually termed zooarchaeology, the plant side archaeobotany. What distinguishes them from other studies of ancient animals and plants is that their ultimate aim is to find out about human behaviour - the animal and plant remains are a means to this end. The 33 papers present a wide array of topics covering many areas of archaeological interest. Aspects of method and theory, animal bone identification, human palaeopathology, prehistoric animal utilisation in South America, and the study of dog cemeteries are covered. The long-running controversy over the milking of animals and the use of dairy products by humans is discussed as is the ecological impact of hunting by farmers, with studies from Serbia and Syria. For Britain, coverage extends from Mesolithic Star Carr, via the origins of agriculture and the farmers of Lismore Fields, through considerations of the Neolithic and Bronze Age. Outside Britain, papers discuss Neolithic subsistence in Cyprus and Croatia, Iron Age society in Spain, Medieval and post-medieval animal utilisation in northern Russia, and the claimed finding of a modern red deer skeleton in Egypt's Eastern Desert. In exploring these themes, this volume celebrates the life and work of Tony Legge (zoo)archaeologist and teacher.